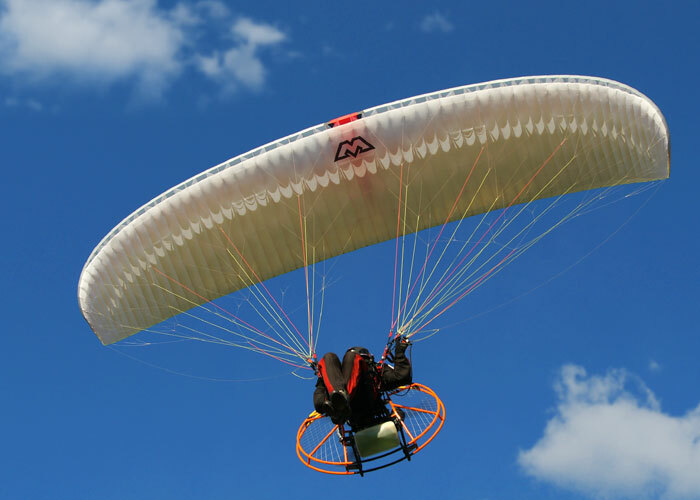 The PitBull RX is a specific paramotoring glider with extraordinary maneuverability. Carefully selected reflex-semi-reflex airfoils, new technologies like Leading Edge C Rod Technology combined with RFE - panel reinforcement technology provide extra speed, performance and stability. The PitBull RX is an all-time favorite among experienced ppg pilots and it is ideal for all tasks of paramotoring competitions. The canopy has 63 cells and has an elliptical form with an aspect ratio of 5.83. The canopy has perfect internal pressure distribution and is very resistant to collapse. It retains sporty handling in all trim settings. The construction using diagonal ribs and a system of load-bearing tapes keep the canopy stable and clean for maximum efficiency through the air. Specially designed airfoils provide extraordinary glide ratio and stability. The smooth shape of the airfoil nose is maintained using Mylar reinforcement combined with plastic rods. Additionally the RFE system – C rods between the main ribs, and the matching mini-ribs along the trailing edge, effectively delivering much of the advantage of doubling the cell count without adding all that extra weight. The upper cascade is made from unsheathed lines. Thin top lines and smaller sizes of canopy help to achieve high speed. The benefit of this new technology is increased glide and lower fuel consumption. The PitBull RX inflates very easily in all conditions even in a light, nil or cross wind. The wing offers sporty handling (even without 2D steering) in all trim settings. Optional adjustment of 2D steering in according to pilot’s preferences can make bank angle of turn even tighter. Good for fast slaloms. The brakes are light at the beginning and provide extraordinary maneuverability by 20% of brake travel. Dynamic maneuvers are easily possible. In the next phase of braking, the pressure increases progressively providing you with good sufficient feedback. The brakes are just as effective with open (fast) trimmers, without the need for a second set of steering toggles like most reflexed wings require. The PitBull RX is equipped with special 5 point risers system and trimmers. For minimum sink rate and low fuel consumption the trimmers should be pulled down. The open position of trim decreases the angle of attack and increases cruising speed. Auto cleaning slots on wing tips help to keep the canopy clean. The 3 type stiffness brakes handles are equipped with swivels and additional thin loops to make control of the glider easier and less tiring during long flights. The glider is delivered with quickbag MacPack (optionaly with backpack Bronco), innersack, compression belt, T-shirt and set for repairs. 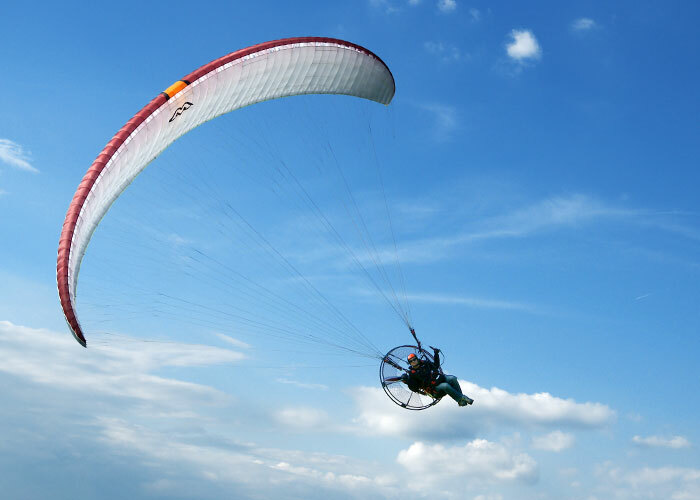 The PitBull RX is an outstanding paramotoring glider which is loaded with highest performance and maneuverability. It is fun to fly it. The hardest part is picking your favorite Colour and Size. If you need help your local Mac Para dealer will help you choosing the right size to maximize the performance of your new PitBull RX. Sizes: The PitBull RX is available in sizes 19, 21, 23, 25, 28. Colors: The main base colors are Orange, Grey, Gold, Red, and White. Clean and elegant, the Pitbull RX is a very sporty wing with refreshing handling and sensations. With top speed of nearly 65 Km/h, it offers precise reactions and direct steering. It also turns amazingly well, offers top performance, and has an effective, easy to use trimmer and controls system. This glider has a very thorough construction: With 63 cells, most with rods on the leading edge + intermediate rods, it boasts a particularly clean top surface which, coupled with the aspect ratio of 5.83, gives it a well well-proportioned appearance. The trailing edge is well defined thanks to mini-ribs and a brake system with pleat. The risers are simple, with trimmers that are easy to handle and do not require special effort to pull in. The brake system is "dual", which allows you to slow down the center or the tip of the wing depending on how you pull. The handles have magnetic clips. Thanks to the leading edge with rods, the profiles of the Pitbull RX are preformed and the glider climbs easily. It has very light inflation and it can even be lively, so it is best to be quick to hold the wing on your head. The good news is that this glider asks for little brake and it is intuitive to handle; if we have speed, just some gas will be enough to take us airborne. We must note that these profiles are very efficient when it comes to restore the energy, so we'll have to manage /extend the 'flare' at the time of landing. We did 23 flights with the Mac Para PitBull RX of 23m2 for this review, mostly short sportive flights with touch-and-gos, banked turns and ground skimming, with different paramotors and load configurations, plus a couple of navigations. Foot-launched, I had total loads in flight close to 140 Kg, using the following machines: Airfer Moster 185, PAP PA125 and PAP Thor 200EVO. With all, including the 125, the take-offs were very comfortable and short; this wing has –undoubtedly– good performance. I also flew with a paratrike Airfer Diamond Thor 250, with a total load in flight of nearly 180 kg. With such load the glider is quite solid and flies very fast, but it tends to drift in the turns; I think that it is too much for the size. For this weight, size 25 or 28 would be better. 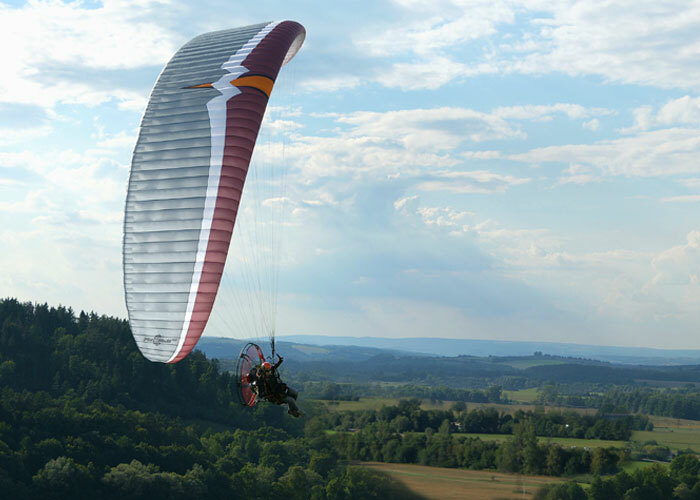 In short, if you want a very agile and fast glider, try to be on the top the weight range; but if you want a more versatile and tranquil wing, still sportive but with an accent on performance (navigations), you can go on the first half of the weight range. The RX has four risers, with split "As" to pull ears, as well as speed and trimmer systems. For take-off it is enough to release one or two cm of trimmer; once airborne you can leave it on "neutral fast" position, which is approximately half opened. From there you can step on the speed bar to the top and reach about 61-62 Km/h. If you then open the other half of trimmer you can still go up to 65 km/h! The good thing is that at that speed the Pitbull RX feels with a lot of pressure, keeps the course, and you don’t have to crush the engine! The long speed system runs smoothly but it is a bit hard by the end, so it is good to use a pair of blocking pulleys if you are going for long raids. Interestingly –as I did not expected it– the Pitbull RX can navigate very straight: it does not suffer the torque effect much so it is enough to counteract by weight-shifting or with a bit of trimmer. As soon as you're flying, this small paraglider keeps high internal pressure: in all the flights I did with it I did not have any loss of pressure or anything strange. The brake handle is attached to the main line –that controls most of the wing– and also to a thinner line that pulls only the tip. When you fly the RX in reflex mode at the top of the speedbar, you must brake only the tip of the wing to correct the course and draw wide tracks, for that you pull the handle to the front of your face. After releasing the bar, when you reach a pylon for example, we can use the brake in all its breadth, even pulling the handle away of the pulley (open arm), which allows you to further curb the center of the wing and amplify the effect of the surge to achieve a direct 180° turn. You have to exit in the desired direction and counter the climb by stepping on the speed bar. This turning technique is usually done in slalom flying and with this glider, without a doubt, you can develop and enjoy it to the fullest. In calm flight the Pitbull RX flies precisely and elegantly, drawing perfect lines without effort, which makes it hard to imagine what a spectacular sporting side it has and all it can offer to the pilot, before trying it. The handling is superb and direct, making the RX a very fun glider, especially if we make good use of the dual control and the speed bar actively. 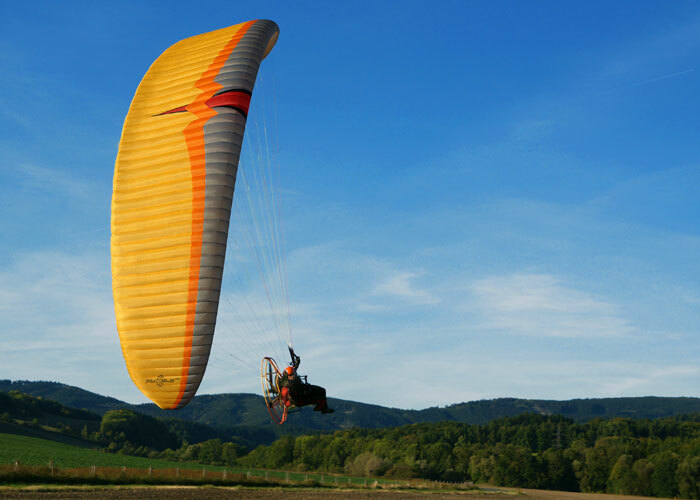 This is a paraglider with reflex-type profiles, of sporty conception and settings. It is aimed at experienced pilots. It is not a dedicated slalom paraglider but it revolves and can be handled very well. 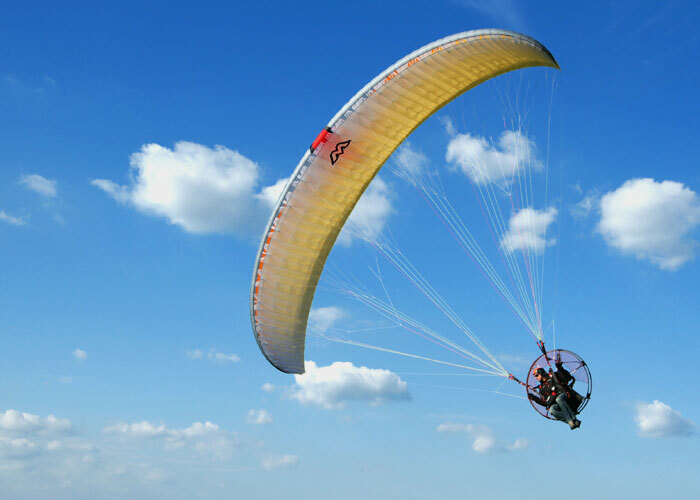 It is solid and fast to navigate and, as it offers good performance, it can be flown with small paramotors. The best of the Pitbull RX is its character, and a very pleasant handling. The-: Lively inflation, it asks for precise inputs. 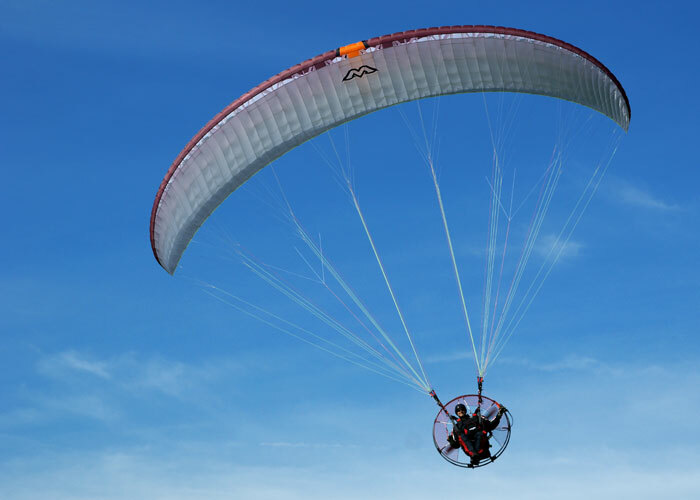 The PitBull is manufactured using the paragliding industries well established lightweight material with excellent durability; Skytex 38, from Porcher Sport (NCV). For the less stressed areas of the sail we use Skytex 38 with E25A coating. For the supporting and diagonal ribs we use Skytex 40 Hard with “hard finish” coating E29A. This gives the advantage of a sail that is both lightweight and very durable.